Resources - Gaynor Law - Chicago Family Law Firm serving Cook County, Kane County, DuPage County, Lake County and Will County. Separation and divorce is complicated. The Lilac Tree provides support for individuals at any stage of this process. Their Mission: Helping people navigate and overcome the challenges of separation and divorce by providing access to legal information, support networks and professional resources. Their Vision: For all people to confidently navigate the process of family breakdown and divorce. 1) Personalized Information Sessions: During a 60-minute private and confidential meeting with a trained Lilac Tree counselor, individuals contemplating or at the beginning stages of separation or divorce receive guidance to help understand the legal, financial and emotional considerations involved in separation and divorce. 4) Referral Program: The Lilac Tree maintains a registry of qualified attorneys, mediators, therapists, financial planners and social service providers. Referrals are made free of charge. 5) Self-Represented Litigant Education: Beginning in 2019, the Lilac Tree will provide general information about the law and the legal process to individuals who are not represented by an attorney. The Lilac Tree is a non-profit organization based in Evanston and serves individuals throughout Illinois. We serve people regardless of socioeconomic status, education, ethnicity, geography, native language, gender identity or sexual orientation. Fee assistance is available for individuals with limited financial resources. All information shared with The Lilac Tree remains strictly confidential. American Bar Association’s Section of Family Law offers easy-to-read information about what you can expect during divorce and child custody proceedings. 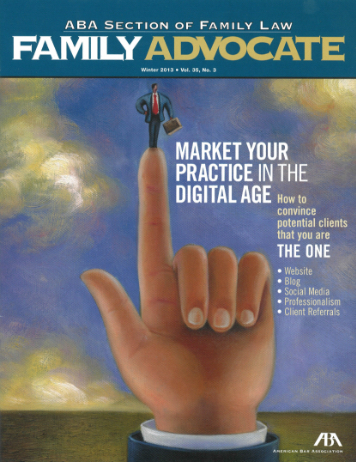 The quarterly news-and-feature membership magazine of the Section of Family Law, addresses current family law topics and provides useful how-to articles in every issue. For more than 20 years, mental health professionals, judges, family lawyers, and their clients have turned to Family Advocate for practical information and advice on handling increasingly complex cases.